A search for suspects in San Francisco was called off Monday morning following an overnight home invasion in which officers were fired at but not injured, according to police. Pete Suratos reports. 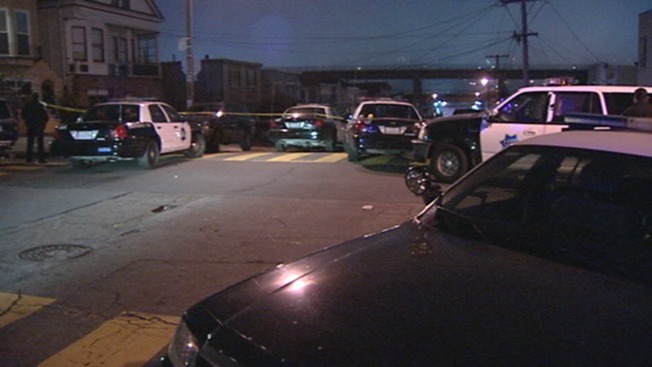 A search for suspects in San Francisco was called off Monday morning following an overnight home invasion and subsequent police foot chase in which officers were fired at but not injured, according to police. The chaotic scene erupted around 11 p.m. Sunday along the 2100 block of Quesada Avenue when police responded to a home invasion call, according to police. Arriving officers set up a perimeter before spotting several suspects exit the home, hop fences and escape into neighboring backyards. During the chase, at least one suspect fired at officers, but no law enforcement officials were hit, police said. No suspects suffered gunshot wounds either. "From what I hear though, it was harrowing," Sgt. Michael Andraychak from the San Francisco Police Department. "Very, very close call for officers that were in the background." At least one adult male suspect was eventually caught, but the rest got away. The police perimeter was expanded to search for those escapees before being torn down around 3 a.m. after no suspects were found. Despite the ground search being called off, police are still looking for the suspects. At least one person in the home believed to be targeted by the suspects suffered injuries, police said. An investigation is ongoing. Anyone with information is asked to contact San Francisco police.